The GloveBox app tracks your car’s expenses and fuel consumption. Add other drivers so they can add expenses or fuel to the app. Your economy and cost statistics are synchronised between multiple devices and accounts - making sure you're always up to date with all your cars, no matter who drives them! Your fuel log and economy data is stored safely in your GloveBox account, so everyone can see each other's fuel economy and expenditure. If you have more than one car you can add all of them to GloveBox and keep their history and information all in one place. Add details of each fill up to get insightful statistics and information about your fuel cost and economy - including cost per mile, historic fuel price and fuel economy charts, cost/mileage per year and lots more. Add non-fuel expenses to GloveBox too, such as insurance, servicing and cleaning costs - see a breakdown by category as well as the total cost of running your car over time, or per mile. Your fuel logs and vehicle statistics are accessible across multiple platforms and different devices. 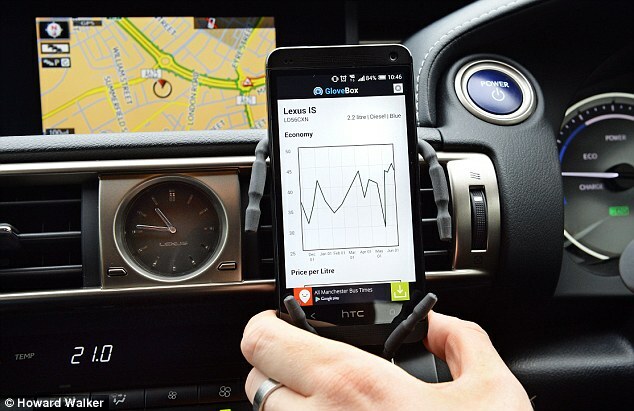 Even if you lose or change your phone the details of your fuel consumption and expenditure are kept safe. GloveBox can send you an email to remind you about events like servicing, tax and insurance renewal. Just set up a reminder in the app, select how often you'd like to receive it based on time, mileage or both, and GloveBox will help you to remember those important dates. You can export your data from GloveBox at any time - just use the 'Export' button in the app and follow the instructions. You can import existing fuel and expense data by uploading a CSV file, read more about how to import data.